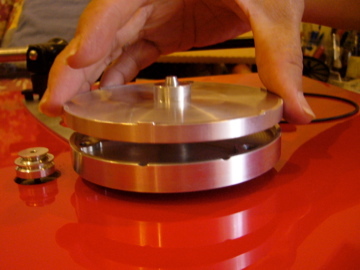 Peter Kisilenko's mono TT upgrades: Part II - "Michael Lim Special"
Recently, Peter Kisilenko, a professional musician from Canada has added some new upgrades to his hybrid mono TT. He has decided to upgrade to 45/45rpm dual pulley in conjunction with Cruise Control TTPSU this time. It's a better option actually, especially for those who wish to fine-tune the TT to the desired speeds. 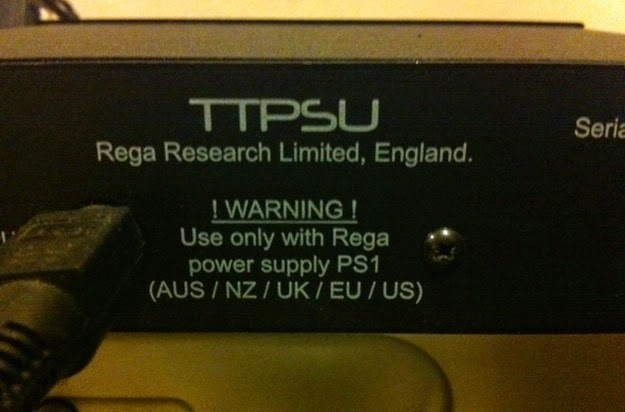 Rega TTPSU doesn't have this user adjustable feature; it only has a push button for selections between 33.3rpm and 45rpm. Besides 45/45rpm dual pulley, Peter has also added both aluminium alloy top bracing and stainless steel bottom bracing together with aluminium feet to his mono TT. He is happy with the positive effects brought about by these simple tweaks. I really appreciate his effort in sending me pictures and comments on the upgrades despite his busy schedules. I am honored (and flattered) to share with you here this "Michael Lim Special" as he has put it! 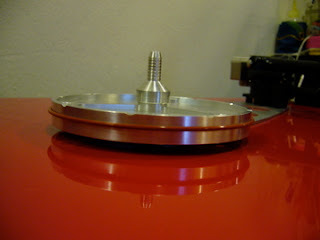 Here's a couple of pics of the latest upgrades to my mono TT. Since I wanted to use the Music Hall Cruise Control 2.0 on this table I installed your double 45 RPM pulley with 2 silicon belts. I also installed the top and bottom braces along with your feet. So this table is basically a Michael Lim special. 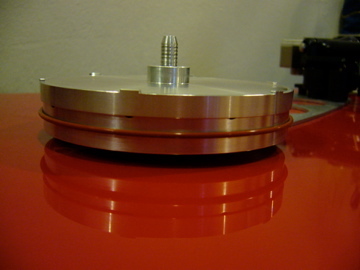 The only original Rega parts are the plinth, motor, and arm. 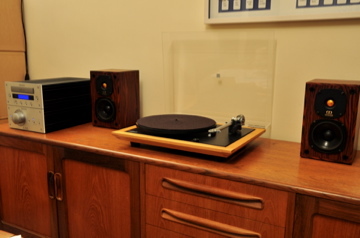 Each upgrade had a positive effect and this is now a wonderful sounding table with great bass, clarity, and musicality. 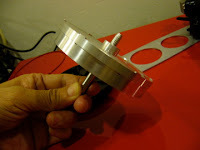 If you don't wish to discard Roy Gandy's fine piece of aluminium sub-platter cap, this version of my RP6 aluminium sub-platter will be used in conjunction with the stock aluminium cap. 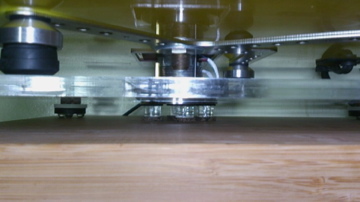 It is slightly different from my standard aluminium sub-platter and it's designed to retrofit the stock aluminum cap. Many wrote to me enquiring on sub-platter for RP6. I told them frankly that I have not "touched" on RP6 yet. One RP1 owner who had used all my upgrades earlier told me that he had upgraded to RP6 and was waiting for me to release my new RP6 sub-platter! Boring details omitted but some watches from my collection got to go in order to obtain WA! 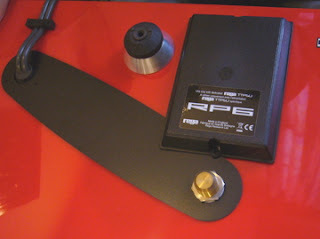 The stock RP-6 is a beauty by itself especially with the glossy red paint finishes. So is the "underslung" black/partially transparent glass platter (weighing just a little excess of 2kg). Another point to mention is : the new RP6 is designed with a 50Hz pulley and a common TTPSU for both Europe and North America. So it will spin "perfectly" without problem anywhere around the world. This is a good point for those of you who may move from one region to another with your beloved TT. You only need to get a 24V wall wart ( AC adaptor) which suits the local voltage without changing any other component. The stock RP-6 is a good sounding deck - far better than my stock P3-24. 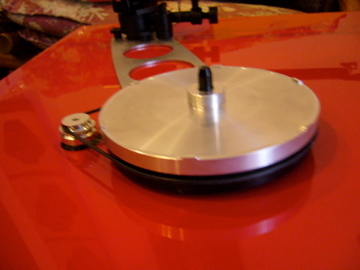 Comparing with the stock P3-24 with glossy plinth, the main differences are tonearm, sub-platter with additional aluminium cap, "underslung" glass platter and double bracings (aluminum alloy for the top and phenolic for the bottom). Whatever it is, for me it would be interesting to tweak my new RP6. I believe it would sound wonderful with some tweaks! After some listening, I couldn't wait to begin with some experiments on it. 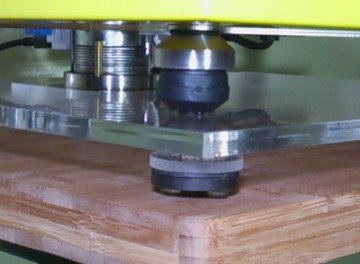 As usual, I started off first with the phenolic sub-platter. Somehow, I don't wish to discard Roy Gandy's fine piece of aluminium sub-platter cap right away. So this first version of my RP6 aluminium sub-platter will be used in conjunction with the stock aluminium cap. 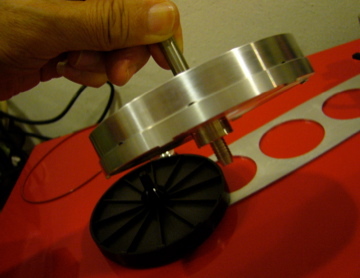 It is slightly different from my standard aluminium sub-platter as this design retrofits the stock aluminum cap. 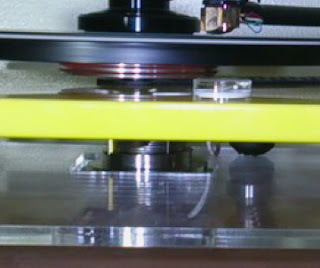 I always recommend silicone belt as an upgrade to the stock Rega black belt. 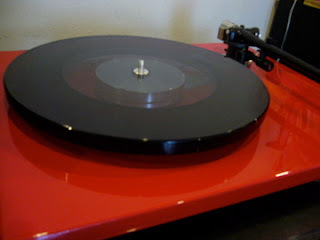 And just recently, I read somewhere that silicone belt is also one of the new features for the new Rega RP40 Anniversary edition to celebrate Rega's 40th anniversary. Not forgetting the underslung counterweight which gives big sonic improvements to all Rega decks; it is a must for my RP6! After these initial tweaks, I could hear significant improvement with lower noise floor, more details and tighter bass. The volume also seem increases a bit as a result of lower noise floor! What about my acrylic platter? Can I try it on this RP6? Just realized by taking off the stock aluminium cap, the stock glass platter can be replaced easily with my 24mm "underslung" acrylic platter and rubber/cork mat. Another versatile option to try for RP6 owners! 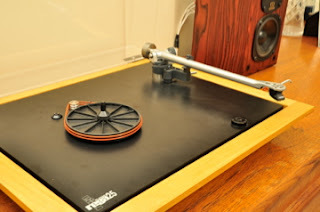 If you are nostalgic of the stock glass platter sound occasionally, you may put the aluminum cap back on the sub-platter and enjoy the glass platter/wool mat combo again. 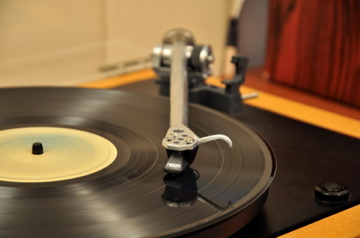 Isn't it interesting that you can switch back and forth the platters as your mood swings? 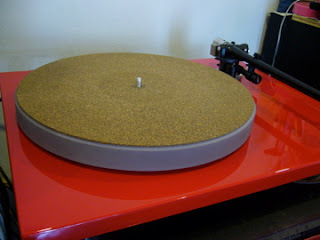 This is one of the reasons I like about Rega turntables! I installed and like the upgrading.. They provide me bigger soundstage and make the music more lively to me. I am not good at describing the music in wording but your subplatter make a real diffierent !! 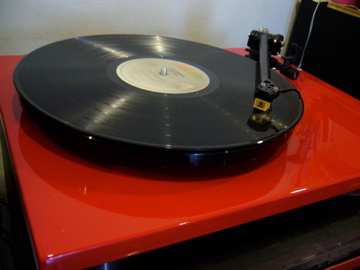 I am still setting up my system with the new speakers and I will send you the photo once everything is done . 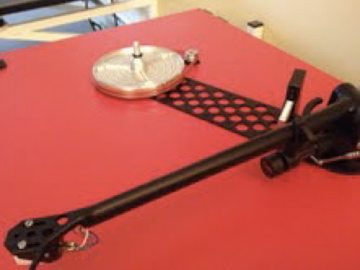 David Woodfall of United Kingdom had upgraded his turntable with underslung counter-weight and stainless steel pulley. 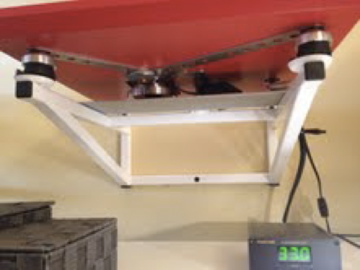 I always recommend underslung counterweight upgrade besides stainless steel pulley as it will bring the performance of your TT a notch higher. 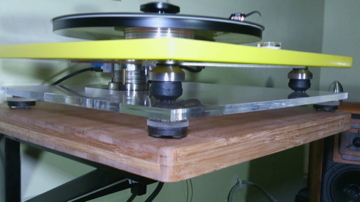 After fixing the new pulley wheel I found that the platter got up to speed directly, with no need to give it the helping shove like I used to do. Speed is constant now with no messing around with glue. Fixing the new counterweight was a little more involved. The old stub was a devil to take off, but copius WD40 and an adjustable wrench finally won (put an old rag under the area to protect the plinth surface, as well as one around the old stub before attaching the wrench). I tightened the new stub finger tight, and I would expect the o-ring/washer to stop it slipping. The rest of the setup was easy. 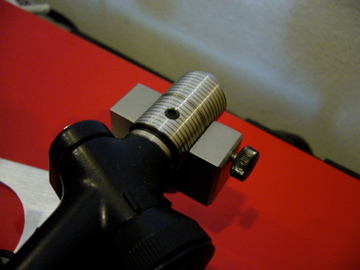 The sleeve attaches on smoothly and the grub screw holds it securely. 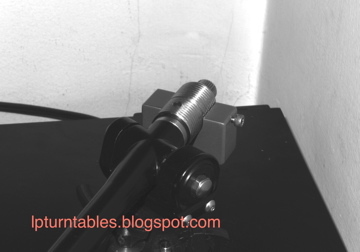 I used a digital scale accurate to 0.01 gms to measure stylus pressure. My shure stylus is one that has a cover that rotates under it, so the stylus doesn't need to touch anything. I found that it was a little tricky to tighten the counterweight screw without it slipping, but once you have it close, the end screw can be used for finer adjustment. I noticed that Michael had wound PTFE tape around the end screw so that it holds tight and should not loosen under normal vibrations etc. The end result is a solid weight that should hold fast for a good long time. 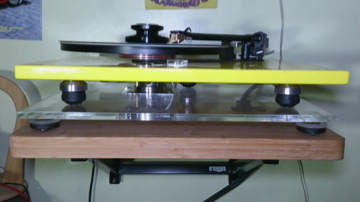 A vast improvement on the original weight that the deck had when I bought it. How do you isolate your turntable from vibrations for better performance? It's fun to find out what you would prefer! "... was able to separate the turntable platform from the motor by making a square hole on the acrylic where the motor isolation base passes through which in turn seats on the lower bamboo platform. Got the idea from the brilliant Canadian:) "
"The footer I used to separate the acrylic from the bamboo base is a mixture of rubber cork, acrylic, dynamat ebony puck and small pieces of 3m bumpons. Here's some pics:"
".... the thing is dead silent! 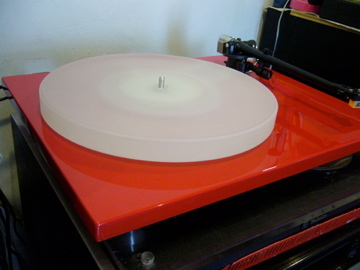 All the details are fully extracted from the vinyl:-) got louder bass also! If you look at the inverted rubber footer(oem), I filled it up with blu tack inside. Other tweakers covered the hole with tape and filled it up with sand! Different strokes for different folks:-) DIY is fun btw:-)"
Yes, different folks may have different preference! The best is to try out yourself to find the answer. As promised I enclose a few photos of your double pulley upgrade and matching belts on my Rega P25. I also took the option to swap out the original motor for a brand new, but identical unit. My turntable gets used a fair amount and the original motor unit had become a little noisy. I’m pleased to say that the swap was very easy and with a little soldering done I was back up and running in no time. I’m also happy to report that your double pulley upgrade has done exactly what I had hoped for. Gone is the shudder on start up, and speed stability is much improved. I always thought the deck played slightly too fast as well and it seems to have corrected that. Everything sounds much more natural now and the music seems to have more space to “breathe” which has the benefit of making it much easier to listen to. Thanks again for the prompt delivery and great service – I look forward to ordering from you again in the future.